For as the lightning lights up the entire sky, so it will be when the Son of Man comes. This scripture is talking about the second coming of Jesus Christ to the earth. 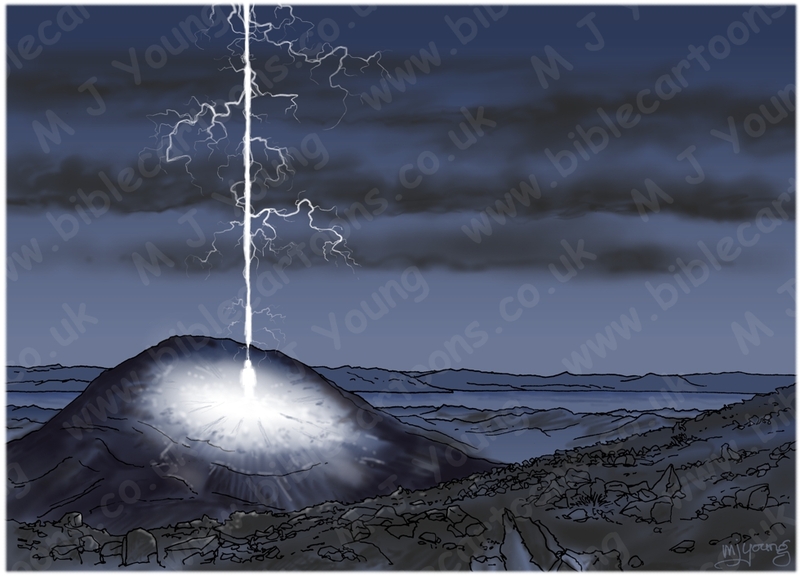 My illustration is of the first coming of Jesus Christ to the earth. Whenever I think about the power of God, I think in terms of energy that I can see or understand. The power that God wields is, in fact, beyond my limited human understanding. When I think about God in terms of His creativity – His ability to make things just by speaking them into existence, that is beyond my experience of power & therefore beyond my understanding. In order to imagine the power of God, I translate His unknowable power into something that I can comprehend. I think that lightning, for me, is almost a metaphor for God’s own heavenly power, made visible for us on earth to see. Lightning is mysterious, unpredictable & immensely energetic. It seems to strike at random, & it’s raw energy & brilliance is breath-taking. When Jesus came to earth the first time, it was in the form of a baby, but had we seen the event with spiritual eyes, I have no doubt that Christ’s arrival was far more powerful & energetic than it appeared to our natural eyes. The Word [Jesus] was first, the Word present to God, God present to the Word. The Word was God, in readiness for God from day one. Everything was created through him; nothing—not one thing!— came into being without him. What came into existence was Life, and the Life was Light to live by. The Life-Light blazed out of the darkness; the darkness couldn’t put it out. When I read the bible about Jesus & consider His descent from heaven to earth, I think in terms of His raw energy & power to change things here. Whilst He did indeed come to earth in the form of a baby, born to a human mother, nevertheless, in the spiritual realm I’m sure the event was far more powerful, energetic, life-affirming & universe-changing! Whenever I think about Jesus coming to earth on His mission to save & reconcile us to God, I think of His descent like an unstoppable bolt of lightning, that Satan & the kingdom of darkness can never stop, nor evade, nor even withstand. God’s arrival on earth was “the end of the story” for the kingdom of darkness, since light always forces darkness to flee.